This recipe couldn’t be easier, or more familiar. Honestly, I make a version of this almost weekly, fall through winter. What could be easier than tossing chunks of hearty vegetables with herbs, olive oil, salt and pepper, and then roasting them at high heat until they’re both caramelized and meltingly tender? The assortment of vegetables varies based on what’s on hand. For this version, I used carrots, parsnips, sweet potato, butternut squash, golden beet, Brussels sprouts and shallots. Other times, I throw in red beets, turnips, rutabaga, or watermelon radish. It just depends what calls out to me. 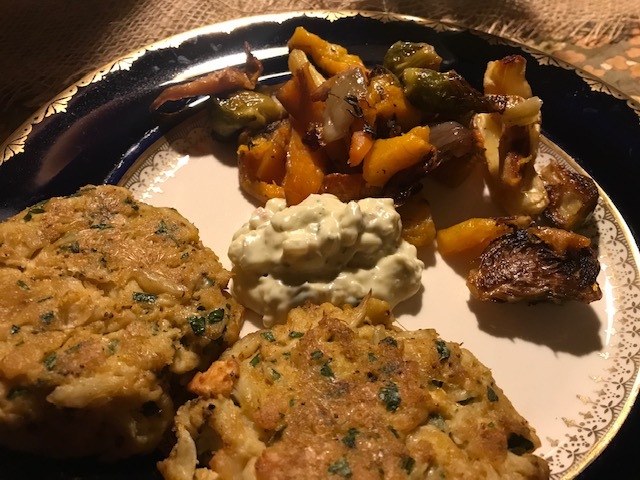 I served roasted vegetables alongside crab cakes on New Year’s Eve. For a leftover lunch, I ate the last of the roasted vegetables over a grain medley and dolloped with homemade mayonnaise. Yum! I really don’t have that much to say about this recipe. It’s as delicious as it is simple but that’s really it. Click here to see other thoughts on this recipe from my friends at Cook the Book Fridays. 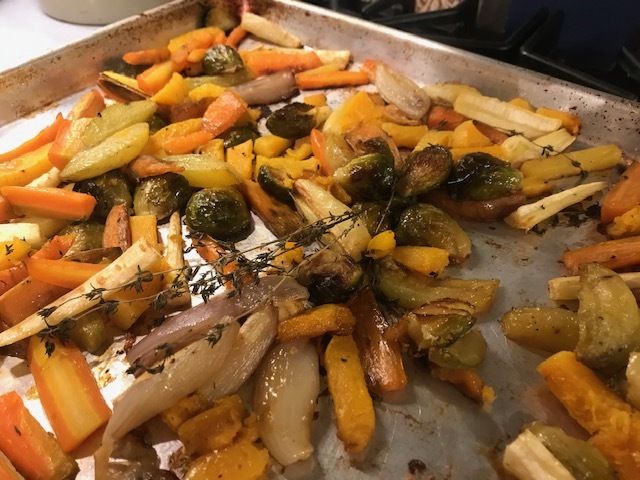 I recommend that if roasted root vegetables isn’t already in your kitchen repertoire and you need more specific instructions, try the recipe on page 225 of David Lebovitz’s My Paris Kitchen. 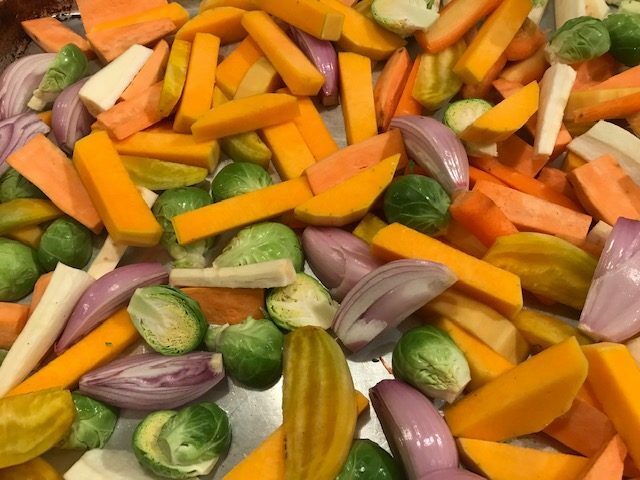 Posted on 18 January 2019, in Cook The Book Fridays, my paris kitchen and tagged Cook The Book Fridays, my paris kitchen, root vegetables. Bookmark the permalink. 5 Comments. This reminds me of Dorie’s non-recipe recipes. Easy but delicious. Agree that this needs to be in everyone’s repertoire of dishes! So versatile! This is a perfect everyday recipe made better with an easy roasting and the varieties of vegetables. The crab cakes look so delish! What a great NYE dinner! I’ve said this to everyone else, but I swear there’s something about this non-recipe recipe that just worked better than my typical roasted veg. Maybe it is the balance and mix of veg? I don’t usually use (m)any shallots, so maybe that added a layer of flavor I’m usually missing? It’s such a pretty dish, too! Loved this, so easy and delicious.